Bali has been a remarkable destination for its natural beauty and rich culture of its people. Among a bunch of heavenly destinations in Bali, Uluwatu Temple or Pura Luhur Uluwatu is one of six prominent temples regarded as the Balinese spiritual pier. Located in Pecatu Village in Kuta District, Uluwatu is rich with culture and traditions. “Ulu” means “top” and “Watu” means stone in the Balinese Language, roughly translated it means stone at the top. Among a thousand temples scattered around the island, Uluwatu perched on a cliff about 70 feet above the sea level and proposes unique Bali architectural sightseeing around the temple as well as a heavenly view of the sunset on the endless Indian Ocean. According to Balinese Hindu history, Uluwatu Temple is believed to be built by Mpu Kuntaran (Javanese Hindu Priest) who built the tiered architecture around the 10th century. Five centuries later, Dang Hyang Dwijendra, a holy pilgrim priest from Kediri East Java decided to choose Uluwatu Temple as his final spiritual journey. As the priest who established the present Hindu-Dharma religion, Balinese Hindu people believed that Dang Hyang Dwijendra achieved moksa (oneness or wholeness) with God in this temple while meditating. This magnificent temple is a sacred place for Balinese Hindu people and highly considered as a divine power to protect The Temple and places around it. Uluwatu Temple and other temples are known to be rich in symbols. One of the main highlights in Uluwatu are three statues and one of them is the limestone statue of Brahman priest looking over the Indian Ocean. The legend has it say that the statue is the representation of Dang Hyang Dwijendra. Upon entering the shrine is the stone-carved split gate and in front of them is the elephant Hindu deity, Ganesha. Another feature of this temple are the two stones that if combined, creating a sarcophagus. When you want to enter the shrine, you must wear the sarong and a sash which are available for rent at the site. You may visit the temple with some charge as a tourist from 9am to 6pm. However, this temple is open all day for worship. Kecak Dance has been the signature dance of Bali. This dance is performed by males wearing black and white gingham sitting in a circle. The dancers are shouting “cak” repeatedly and therefore this dance is called Kecak. Male performers put their hands in the air toward the center of the circle. Kecak Dance performance started at 6 pm on a daily basis at the adjacent cliff, providing the audiences with the stunning view of the mythical dance with the sunset as the background. This dance performance is for tourists only and is charged for some fee. However, there is also a cultural ceremony hold for every six months, which are meaningful for the Balinese Hindu people. There are two ways to get to the main entrance, the north entrance, and the south entrance. Along the serpentine pathway to reach the main entrance of Uluwatu temple, you will be greeted with hundreds of monkeys lay about the dry forest. These monkeys are dwellers of the forest and believed to be protecting the temple from bad influence. You are strongly recommended not to bring out any attraction for them such as cameras, jewelry, phones, etc. 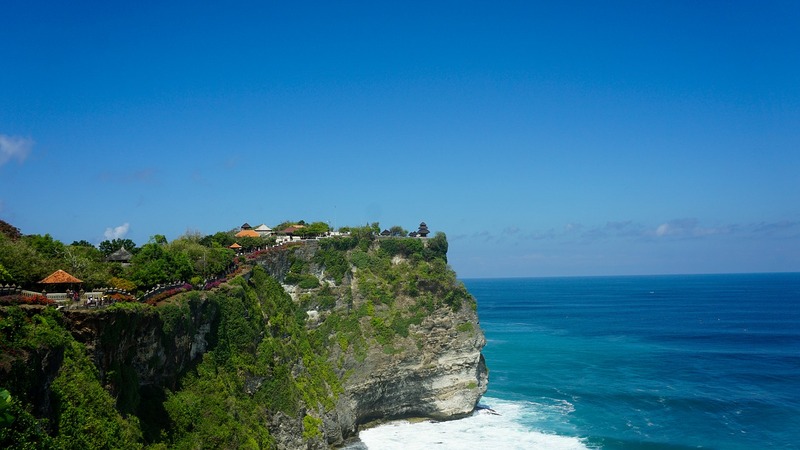 Sitting on the steep cliff above the sea gives Uluwatu Temple appealing atmospheric of the khayangan (heavenly place). Watching the sunset on the horizon of vast Indian Ocean is certainly a wonderful privilege you can’t miss. There are also small restaurants or warung on the cliff, offering various treats while you overlook the pounding water beneath the cliff. While you plan to spend your vacation days at Uluwatu, try not to miss the Uluwatu Beach. Set below the cliff where Uluwatu Temple settled, is the famous surfing spot for professional surfers around the world. Those experienced surfers who seek adventurous surfing and upgrading their skill are suitable for this surfing spot. Known for its consistent wave, a variety of breaks give this beach the number one surfing spot in Bali. In order to get to Uluwatu you may need to get prearranged transportation such as renting a car with Tripcetera to get the best deals. Public transportation is a bit difficult to find and touring with Tripcetera will significantly ease your vacation planning and giving you the best experience in Uluwatu.